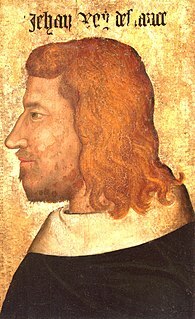 Louis I was the second son of John II of France and Bonne of Bohemia. Born at the Château de Vincennes, Louis was the founder of the Angevin branch of the French royal house. His father appointed him Count of Anjou and Count of Maine in 1356, and then raised him to the title Duke of Anjou in 1360 and Duke of Touraine in 1370. 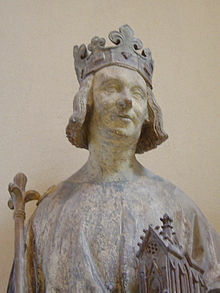 John I was the Duke of Lorraine from 1346 to his death. As an infant of six months, he succeeded his father, Rudolph, who was killed in the Battle of Crécy. His mother was Mary, daughter of Guy I of Blois. Étienne Marcel was provost of the merchants of Paris under King John II of France, called John the Good. He distinguished himself in the defense of the small craftsmen and guildsmen who made up most of the city population. Bertrand du Guesclin, nicknamed "The Eagle of Brittany" or "The Black Dog of Brocéliande", was a Breton knight and an important military commander in the French side during the Hundred Years' War. 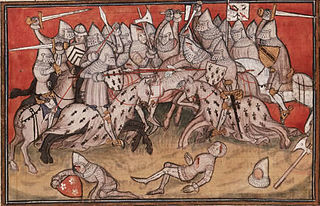 From 1370 to his death, he was Constable of France for King Charles V. Well known for his Fabian strategy, he took part in six pitched battles and won the four in which he held command. Chivalry and Betrayal: The Hundred Years' War is a 2013 documentary television series written and presented by cultural historian Dr. Janina Ramirez looking at a time when the ruling classes of England and France were bound together by shared sets of values, codes of behaviour and language for three hundred years that ended with the Hundred Years' War when chivalry ended with the devastating warfare of cannon and betrayal between rulers when England lost her French possessions. It was originally broadcast by the BBC in February 2013. 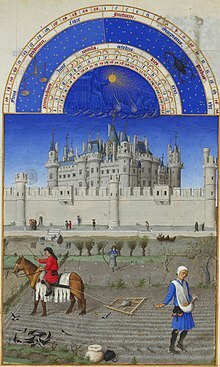 Jean I Le Meingre, also known as Le Boucicaut, Marshal of France was a 14th century French noble.